In my previous post I suggested that salvation for the British High Street lies, first and foremost, in the rediscovery, the reinvention, of SERVICE. So how could that work? A small town near me is proud of its mix of independent shops, galleries, cafes, restaurants and bars – so proud that its traders recently fought off the “threat” of a Harris + Hoole artisan coffee shop, which is owned by Tesco. To be sure, there are already many independent coffee shops in the town (plus a Costa). If you want to buy coffee after 5pm, however, Costa is the only option; indeed, the others tend to keep irregular hours, for reasons best known to themselves. On one occasion – the proverbial wet Tuesday afternoon – I decided to visit one of the others for the first time, only to be told “Sorry, we’re closing, because it’s raining”! The connection between the inclement weather and a potential uplift in trade didn’t seem to occur to them. Likewise, until the recent arrival of a supermarket convenience store, which remains open until 9pm, a resident would have to jump in the car and go out of town to buy anything after 8pm – which, given that a lot of commuters live in the town, was not a particularly convenient state of affairs. The town’s traders’ Facebook page, which provides a forum for those with an interest in supporting the individual character of its High Street, tends to focus on the negative impact of any incursion by national chains. When I commented that the convenience store would be a “convenient” addition to the residents’ offer, I was told that no-one wanted to shop after 8pm. Suffice it to say that the store now appears to be trading healthily right up until 9pm. 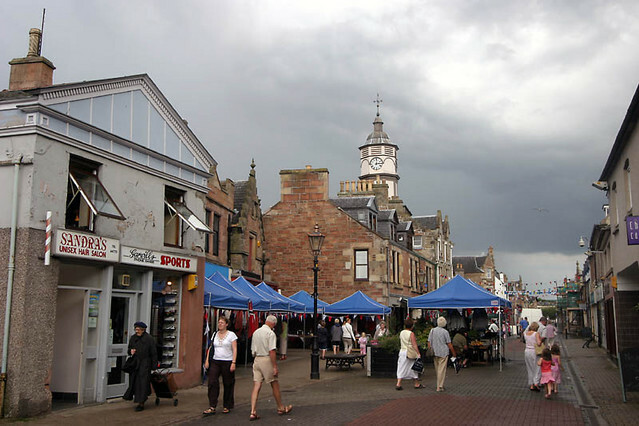 A few years ago, I was asked to lead a project to support the independent retailers of Dingwall, in the Scottish Highlands. Already adversely affected by the relentless upgrading of the retail offer in nearby Inverness, the retailers felt that the recent opening of a new Tesco store in Dingwall itself was the last straw. Yet, a few months later, the whole retail community was working together, promoting Dingwall as a haven of choice, quality, and above all, of traditional, SERVICE. United behind a new Service Proposition, they were offering extended opening hours, tailored promotions, events and festivals. And – they were supported by the local Tesco management, which was happy to play its part in the community and provide a showcase opportunity, enabling the independent sector to promote itself to the largest potential audience in the most cost-effective way. This turnaround was not achieved without a lot of hard work, and it has to be said, more than a few tears were shed along the way! Additionally, support from the local enterprise company enabled the early-stage facilitation, and the first phase of the events programme, to happen. The point is, we started with a determination to do something POSITIVE. We provided Leadership. We facilitated the development of a differentiated, Service Proposition (their Purpose, their “Why”), created, owned and brought to life by the businesses themselves. We created a momentum and an energy that became contagious, so that more and more of the town’s existing organisations and movers and shakers wanted to get involved. Back to my original point – we identified ONE step we could take, and from there we dealt with the challenges – and opportunities – that presented themselves. And, we made something positive happen! In my next post I will describe the anatomy of a plan that could make a positive impact on any High Street. In the meantime, if this story resonates with you, please let me know – and above all, please share it!